Our Tempurpedic Symphony Pillow Review - The Right Choice For You? Tempur-Pedic is undeniably one of the most established brands on the market when it comes to all sorts of sleeping solutions. They are known as one of the hard hitters in the industry, and their mattresses are usually on the high end of the price tag. The same could be said about their other solutions, including pillows. With this said, though, the Symphony pillow is one which is designed to be well worth the money the company is asking for. Regardless of whether you are a stomach, side or a back sleeper, the memory foam filling is designated to keep your neck aligned and to ensure that everything is handled properly. Let's waste no more time and jump right into our Symphony Pillow review! Obviously, the first thing to consider when it comes to choosing a pillow is its construction. Just like mattresses, the construction of the Tempur-Symphony is something of tremendous importance and you ought to account for it. This one is made entirely out of memory foam filling. Now, if we have to be exact, the foam is made of molded Visco-Elastic Polyurethane. 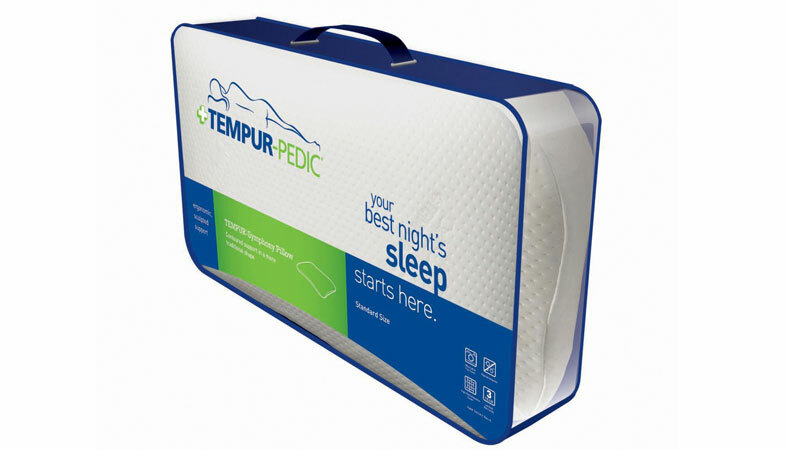 The profile of the Tempur-Symphony is 5 inches thick, and the filling is dual sided. One of the sides looks like a hilltop. This is what the company describes as “gently arched”. The truth is that the arch is more expressed than a gentle one, but the fact of the matter is that it’s plainly ideal for back sleepers. If you want to sleep on your side, or your stomach, you should flip the pillow to its other side. The material is well-known for some of its main properties – it is going to contour your head properly, and it’s going to allow for perfect support to your neck. If you are experiencing any spinal pain or aches associated with your back, the issue might easily be with the pillow. The cover is made out of polyester entirely, which is something quite convenient. It is intended to ensure that the pillow is breathable and that it doesn’t sleep you too hot. In other words, you wouldn’t have to worry about flipping it on the colder side in the middle of the night. This is quite important. Having said this, it is also rather soft, and it does deliver a slight, mesh-like sensation. This is mainly because this model promises to be very breathable. Of course, the cover is zippered, and it is removable. You can easily remove it and throw it in the washing machine or tumble dry it if you feel like it. The only thing that you’d have to do is to remove the filling, obviously. However, it’s important to make sure that you take a look at the instructions to ensure that you don’t ruin the fabric of the cover. Obviously, this product does have a lot of strong suits. Right off the bat, it is very easy to care for it and to maintain it thanks to the easily removed soft cover. 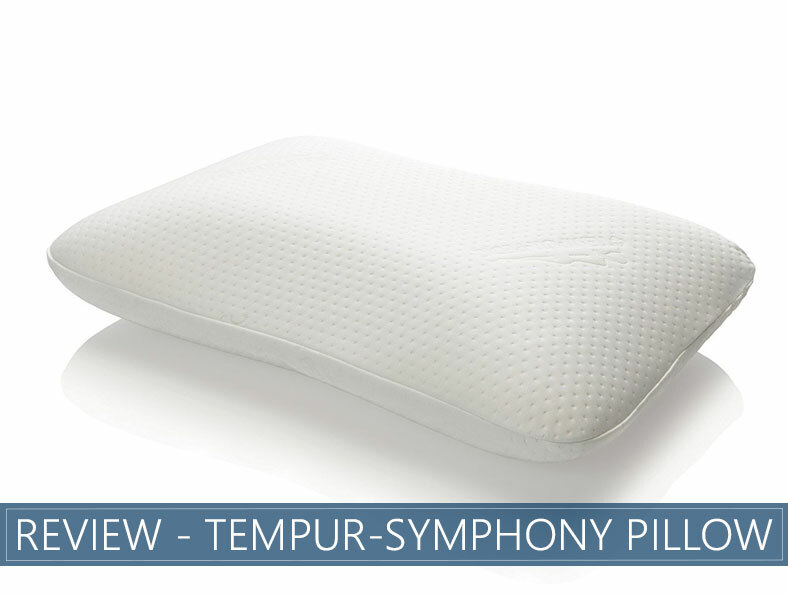 The Tempur-Symphony is also dual-sided which his going to deliver options for all sleep types. This is also something quite important. The foam which is used in it is thick – this is something that’s going to deliver proper molding capabilities. You can rest assured that it won’t flat out as well. It is great for people who have large or medium frames. Sure, like everything, there are certain shortcomings. First off, we’d like to start off by saying that there are no trial periods which are available so you would have to rely on your experience in the store. For memory foam solutions we all know that this is not the best case. The profile of the Tempur-Symphony might turn out to be slightly higher for stomach sleepers. However, at the same time, it might also be a bit firmer for slender or petite sleepers. You are not able to wash the entire pillow but just the cover which means that there is no real way of getting rid of the pollutants stacked within the pillow. Professional dry cleaning seems to be the only way to go. All in all, this is a great solution for people with different sleeping preferences as it would accommodate all three positions. However, it would largely depend on your overall body frame as well as your weight. This is something quite important, and you should keep it in mind when it comes to it. It is also important to note that you might be better off giving the pillow some time to adjust to your head and neck – it might feel slightly awkward right in the beginning, but it would fall into shape quickly.